A digital source capable of excellent resolution and extreme transparency. Denial is a powerful force. As much I've tweaked and nourished my vintage Muse model two DAC (circa 1996) — you know, with sheets of ERS paper to block EMI/RFI, dollops of AVM (Anti-Vibration Magic) to dampen soldered connections, Boston Audio Designs footers and a great JPS Labs Digital Power Cord — it has long been suspect of being the weakest link in my chain. Not from the standpoint of durability, as it had been powered on almost continuously except during thunderstorms for all these years, but technology continues to march forward. So when I covered the TAVES 2011 show in Toronto in September, I was seriously in the hunt for a new one. Why not? The time was right. With the high-end zinging toward computer based music files there has been a lot of development in DACs and hybrid components incorporating them. Now, I'm definitely not l a computer geek, but the idea of integrating my laptop with my audio rig was floating on a rising tide of curiosity. For a guy whose oldest vehicle dates back to the 1800's, storing music on a computer is stretching the parchment. "A silver DAC from Calyx Audio, a Korean company that has evolved from making parts to now include its first complete component, caught my eye. Bernard [Li] showed me a black sample that was built like a tank and felt like a brick. It runs off a wall mounted DC transformer or USB power and features the Sabre chip that is such a hot topic these days. I was so impressed I asked him to wrap it up for me." Actually, I'm not sure I knew it had the Sabre chipset until I began reading the literature once it was up and running. The published specs were certainly impressive — THD +N 0.0005%; SNR 124 dB, A-weighted; Channel Separation 140 dB @ 1kHz, 130 dB @ 20 kHz; Input Resolution and Sample Rates from USB: 24bits with everything from 44.1 to 192kHz and from Coax working with up to 32bits from 44.1 to 192 kHz. With numbers that good you might expect it to translate song lyrics, too. (I'll come to that in a moment.) The ESS Technology ES9018 Sabre Reference 32-bit DAC chip has certainly garnered fabulous acclaim in other DACs — notably the OPPO 95 universal player and the Wyred4Sound DACs — but we all know that it takes more than a great chip to make a great DAC — power supplies, filters, USB input stages and analog output stages being prime areas for consideration. Could this be the DAC that lifts my system to the next level? The Calyx is the first complete audiophile component from Digital & Analog Co., LTD, a company that has previously been making Class D ICs for unnamed OEM companies. This opened the door for speculation on how good this DAC might be. One thing is for sure — they've fired their opening volley into an arena that is a hotbed of activity in the high-end. More recently they have introduced the Kong USB Headphone Amplifier, Coffee USB DAC 24/96, The Integrated, a 200 wpc integrated amplifier with the same footprint as the DAC reviewed here, Calyx 500 monoblock power amplifier and the AL 2-way powered speaker. This bevy of products should keep the buzz going long enough for them to gain a foothold in the North American market. I was excited not only because this was a new company exploding onto the playing field, but because in the grand evolutionary media scheme I sense the traditional CD format is blossoming in much the same way as the LP entered a Renaissance after being displaced by the CD. Time will tell, but in the ‘here and now' I needed a good (preferably great) DAC that would keep my boat afloat in this sea of transition. The photo that accompanied my TAVES report showed the business end of the Calyx because this is the hurdle any component must clear: will it integrate with my current rig? Will I have to give up something I already own? Or will it force me to buy something else to accompany the new DAC? Having purchased the Coincident Statement Line Stage, a world class preamp with somewhat limited inputs, I needed a DAC with both single ended and balanced outputs for system flexibility and reviewing purposes. I also wanted a DAC with both coax and USB inputs so I could pull bits from both my vintage Sony ES CD player (a real work horse used as a transport) or from a computer. The Calyx qualified on both counts. What I didn't notice at first was that the Calyx would render the JPS Labs Digital power cord useless, since it came with its own outboard power supply, a 5 volt switch mode wall wart. This was a far cry from the power supply of the Coincident line stage which looks and weighs like a power amp by itself. The good news is that the power supply is separate from the DAC and the wall wart was later replaced with the new Calyx Linear Power Supply that accepts an IEC power cable. While housed in a smaller and less elegant chassis than the DAC, the new power supply is expected to reside on the floor, hidden from view and away from critical signal paths. The DAC itself is modest in size and looks like a page out of a Bauhaus catalog. Fit and finish is exemplary with the Digital and Analog corporate logo deeply engraved in the top. I find it very understated and elegant in black; suitable for the finest homes. I started the reviewing with the wall wart running into a Synergistic Research QLS-6 power strip which was run off the outstanding Synergistic Research PowerCell 4. I also tested to see if things sounded better if the PowerCell 4 was by-passed by plugging the power supply directly into the 30A dedicated line. It sounded worse. The thin unshielded power cord running from the power supply to DAC ran counter to what I thought I had learned about the importance of High End cables, but since it is a captive cord, there wasn't anything I could reasonably do about it. In spite of the inexpensive power supply which I used for most of my reviewing, there was an immediately recognizable increase in focus that told me this DAC belongs in the Big Leagues. And this was with the DAC sitting on top of the CD player using its non-skid rubber-like feet, kind of like a race car with street tires. It didn't take long before I reached into my bag of tweaks and pulled out three different sets of reasonably priced high quality footers. In spite of the heavy chassis which is machined from a block of aluminum, each set made a substantial improvement to what was already very impressive music coming from my familiar compilation disc. The Boston Audio Design TuneBlocks have been my long term reference and produced a very pleasing and noticeable improvement in focus and inner detail, but it was surpassed by two newer designs I featured in my Christmas Gift List in the December, 2011 issue. The Synergistic Research MiG footers brought out the air and sense of space of the recording venue that made the music more liquid and more palpable to my ear. The Nordost Sort Kone AC footers provided even better focus, a more "accurate" sound, but were also slightly on the drier and more analytic side. This is the realm of very fine tuning and the success of any given footer vs. another will be somewhat system dependent. I wouldn't suggest you immediately run out and buy one brand over another if you already own good footers, but if you're like the guy who goes racing in the streets at night you're going to want better tires on your Calyx DAC. It's a very serious contender. The Sabre chip is known to be a great suppressor of jitter, so I tried a variety of digital interconnects to see if the implementation of the Sabre chip would minimize the importance of spending big bucks on a digital cable. The least expensive (maybe $25/3') was the Video Brilliance 1506 by Belden, a vintage 75 Ohm shielded coaxial cable that might still be in production. I then stepped up to the Black Cat Veloce ($123/1.23m) and my reference Audio Sensibility Statement S/PDIF ($219/1.5m), both 75 Ohm cables. And finally, seeking more transparency, I tried an Onda Kyra 2 mostly silver interconnect which was not a 75 Ohm cable ($500/1m, per cable). While the improvements were noticeable and trended in the same direction as the increasing prices, the differences were small. Even the almost generic Belden cable delivered an acceptable performance, but you will probably want something better. The Audio Sensibility Statement represents the elbow in the performance/price curve, here, but the difference in performance between the least and most expensive of these cables was not as great as the benefit of adding a good set of footers beneath the unit. And the difference among the footers themselves is more pronounced than the differences among these cables. The footers contact the bottom of the DAC, which I noticed was the only removable side of the chassis and probably the thinnest. The Calyx sounded very good right out of the box, an obvious jump in quality from my vintage Muse, but I was told it needed a long break-in, so I let it run 24/7 with the Sony ES on "repeat" for three weeks while I worked on the TAVES 2011 report and kept up my day job. It blossomed. And after playing around with the footers, I settled into listening for a lot longer than the distributor hoped I would. I fell so deep into enjoying the music that I didn't want to write the review. But what does that tell you? Probably not what you want to read. I'm sure you'd rather hear about the wide and deep soundscape and the exquisite focus that made even the most distant back-up singers totally intelligible, which brings me back to the DAC's ability to translate lyrics. It didn't quite translate the African singers at the opening of Paul Simon's "Diamonds on the Souls of Her Shoes", but it was clear enough that I could almost chant along with them. When the focus gets this good, it allows the brain to relax and enjoy the performance. Yet there is something unreal about such wall to wall acoustic focus. It is kind of like High Definition TV where everything in the frame is in perfect focus. This is quite unlike real life where the eyes focus on a particular object and things further away or in our peripheral vision are not in focus. Likewise, sounds from further away should sound less clear, but multi-miking and studio mixing have the ability to keep most everything in focus. The Calyx gives you the mix that's on the recording. Listening to test recordings from Ray Kimber's IsoMike TESTS 2005A using a special "flying" microphone suspended above the audience that records in surround mode from nearly a single point was very revealing. Of course, using a stereo DAC with stereo front channels does not give the same experience as the full surround experience from the IsoMike recordings, but it was really, REALLY good — almost as good as I recalled hearing it at CES a few years ago with a full surround sound rig priced in the several hundred thousand dollar range. The Marching Band tracks gave a real sense of being there as the band marched forward and the sound became louder and more highly resolved. Likewise, the Orchestra tracks conveyed the experience of music in a real hall with the reflected sound blending the instruments as you would actually hear them if seated mid-way back in the venue. Tracks of String Quartet were similarly convincing, as was solo Piano tracks. The take away here is that the Calyx will give you what is on the recording, revealing the most subtle detail and getting you as close to the live experience as the recording, your listening room and the rest of your rig will allow. My Kharma speakers are good down to the low 30 Hz range. Most music I listen to does not go below that range, so the Calyx experience was like an upgrade to my speakers — tight and fast down to that limit, then silence below it. But suspecting some of you would like to know about the deep bass, I re-installed my Tekton Designs OB4.5 open baffle single driver monitors and partnered them with a pair of Tekton Designs dual concentric subwoofers. Unable to locate the external crossovers for this combination due to Christmas decoration projects, I ran the monitors full-range (maybe 50 Hz to 12 kHz) and set the subwoofer crossover at about 60 Hz. Expecting to hear merely deeper bass, I was surprised by a purity and delicacy in the treble that surpassed the Kharma. Since there is no crossover in the Tekton monitors, perhaps I shouldn't have been surprised, but this gave me additional insight into the excellence of the Calyx. The Tekton subs gave the music substantial authority and added low frequency room tone that escapes most loudspeakers. The bass was solid and the room tone present in live recordings contributed to the sense of reality. Audience applause, while mostly above the bass region, became even more realistic. Timbre on large drums was equally impressive. But to test the really deep bass I pulled out John Marks' compilation of organ music, Pipes Rhode Island. Not only were the churches alive with music and room tone, but the organs on really deep passages were reverberant and tuneful — no one note thumping with the Calyx. To further substantiate these perceptions I disconnected the Tekton monitors, raised the crossover on the subs to about 100 Hz and cranked the volume up. Weird — all that room tone and deep organ notes down to possibly 16 Hz — but enlightening. I've heard tighter deep bass, but only from bass units costing many tens of thousands of dollars. The Tekton subs (at maybe $600 each) acquitted themselves quite well and suggested the Calyx is quite accurate all the way to the bottom. With only a 200 watt BASH amplifier in each sub, it did not rock the house at these lowest frequencies, but the quality and substance of what I heard was far more enjoyable than the silence at the deepest level from the Kharma. Another point came to light when I played a CD with a rather high volume level. In balanced output mode, the DAC puts out 6.8 Vrms, which meant with the high sensitivity of my Coincident Statement Line Stage, volume had to be set at the first notch on the left and right volume knobs. There wasn't room for adjustment. With most CDs I was up three notches for listening with peaks in the 86-90dB range. This was still far from the center of the dial where I would have more finite control of the volume, but I've learned to live with it. The single ended output of the DAC is 2.2Vrms which means I should have to turn the volume up a couple of notches. I happened to have both a balanced and single ended set of interconnects from Onda Systems, a new cable company from Calgary, Alberta, Canada on hand so I checked out the volume with each pair of these fine silver cables. There was about a 4dB difference between them. The single ended pair required cranking the volume knobs up two notches, but then it was about a dB louder than the balanced pair, so direct comparison was skewed. There is probably a formula to calculate the exact dB difference between the single ended and balanced outputs, but I'm not that kind of guy. The input sensitivity of your preamp and its attenuator may differ from mine so this may not be a problem for you. In the USB mode, the upgraded Calyx driver which you can download from their site allows you to control the volume in the digital domain from your computer, so this becomes a non-issue. By this time, you've probably guessed the Calyx has no remote control. That's part of the reason it sounds so good, I suspect . Unlike the comparison of the digital input cables where the differences were small, the interconnects used with the Calyx made more significant changes. The Onda System cables were the most transparent, most focused and most dynamic interconnects I've had in my system. Using them at the front end of the rig took the entire system to a higher level. The Onda cables also required more listening energy to process all the additional music presented as a result of its increased focus and transparency. All of the observations to this point have been with CD sourced material. Being more of a jock than a geek, I leaned on my good friend Tom to download some high rez tracks onto my laptop and bring a non-audiophile USB cable over to give me a taste of music at various levels of resolution. To tap into the cliché, my jaw did not drop all the way to the floor because it was already half way there with 16-bit/44.1kHz Red Book CDs, some of which were aided by the Chisto Disk Analoguer treatment, chronicled in my Christmas Gift List. It was easy to pick up on the greater resolution which yielded greater timbre to drum skins and cymbals alike. Micro-dynamics — those subtle little differences in the quavering of notes were easily perceived; the macro-dynamics on the other hand did not change as dramatically with the hi-rez files when I was using the wall wart power supply. Another shortcoming can also be laid upon the wall wart. When I switched from CD to hi-rez files the increase in resolution or focus was dramatic with the Calyx. But the transparency, while also improved, did not reach the same exalted height achieved by the increase in focus. A higher grade of USB cable might help out, as evidenced by the many offerings of USB (and HDMI) cables from major High End cable manufacturers. A series of articles in recent publications points in that same direction. I'll admit I'm on the learning curve here and my experimentation was not in depth. Nonetheless, it was easy to perceive different levels of resolution from the samples on hand, 24/96 and 24/192 primarily. Moreover, I felt like a kid tasting candy for the first time. I liked it! Though you're probably not surprised. "When I listened to my compilation CD on your system last night, it didn't seem to sound as good as I remember it sounding in the past. In particular, both male and female vocals seemed colored. They sounded "chestier", as though there was a mid-bass resonance. I'm not sure what might have been causing that. I don't think that it would be the DAC since it didn't do anything like that on my system. Or maybe I heard the compilation CD a few days ago on the JM Reynaud Offrandes, which spoiled my ear for anything else." "Hearing the Calyx DAC in my system, and comparing it to my old Bel Canto and my DACmini, made me realize that I need a better DAC. But there are several reasons it won't be a Calyx. First, the problem with the input selector switch being on the back panel.... I would want to be able to use my new DAC with both my SACD/CD player and with the music PC and I don't want to have to fumble behind the unit to switch between the two." Two small high quality toggle switches are located on the back of the Calyx DAC. One switches between using the external power supply and drawing power from the USB connection. The other switches between the S/PDIF digital input (RCA) and the USB connection. I've always owned components with power switches on the back side of the unit since my Musical Designs SP-1 preamp back in 1991, so this is not so scary for me. The switches are small, however, and a little white dot taped to the top of the DAC above each switch would facilitate locating them without having to peer behind the unit. Familiarity over time will breed competence, assuming you have clearance above the unit to reach the switches. And since the unit is not very deep, it may be easy for you to peer and reach in from the side. "Second, the Calyx doesn't have a sample rate display. That's not an issue when you're using a DAC with a CD player, because it's always 44.1. But when using it with a computer, it's really helpful to know what sample rate the DAC is receiving. It's fairly easy to get the configuration settings in the computer wrong, so a high res file gets down-sampled to lower res. Or vice versa. Having a sample rate display on the DAC lets you know what's going on so you can correct problems like that." "Third, and most important, I didn't like the way it sounded in my system. It had a large soundstage with lots of depth. It was also very transparent — too transparent, I think. When James Taylor sang, it sounded like a semi-transparent, ghostly image of James, not a real flesh-and-blood person. I've heard that characteristic described as "physicality of the image", and it was a problem in my system. The same CDs played through my Marantz sounded better. I listened for that problem last night on your system and didn't hear it. So for some reason the Calyx seems to work better in your system than in mine." I can't explain the difference for sure, but I suspect the Synergistic Research PowerCell 4 and power cables might have something to do with it, or possibly the MiG footers. I understand what he means though, as the Calyx was not well fleshed out before the break-in. Perhaps it needs to be left powered on for several days before it comes to life — a luxury Tom did not have given the short term of the loan. I left it on pretty much constantly during the entire review period. In any case, the Calyx seems to respond to different cables and footers, so you will quite likely be able to fine tune it to your preference. The introduction of the Calyx Linear Power Supply came just as I was about to submit my review of the DAC for publication and I obtained one shortly after Christmas. At CES it was decided that the CLPS would be bundled with the DAC and I think this is a wise move. It makes substantial improvements that are commensurate with the additional cost, yet doesn't take the final price into the next tax bracket. Focus was improved a bit, but the larger gain was in bringing the transparency up to a comparable level of excellence. With the wall wart, transparency did not make gains that were as impressive as the increase in focus. The IEC connector allowed me to use more serious power cords and this allowed the opportunity for additional tuning. An Onda Kyra 2 power cord which came with Morinco plugs for $999 provided outstanding transparency with its silver plated copper conductors. (It is being replaced in their line with a new version that will include Wattgate silver connectors and 12 awg silver conductors, giving it an ‘all-silver' story that is claimed to give a 20% to 30% improvement at $1400.) It also gave better dynamics and a more defined leading edge to the notes. Notice I didn't say ‘sharp leading edge'. The attack of notes with the Calyx DAC does not overshadow the body of the notes. The notes simply appear, and then decay. There is no damage to brain cells, no headache inducing coarseness or edge to the music. Pace, rhythm and timing are so perfect they do not call attention to themselves. With the addition of the power supply there is an even greater disconnect between the desire to analyze the sound quality and the desire to simply bathe in the experience of the music. Listening to Live Rust by Neil Young & Crazy Horse through the Muse DAC could give me a headache if my mind was not in a good place. With the Calyx DAC the improved resolution and transparency allowed me to not only revel in the detail that was previously hidden by all the ‘noise', but also experience the personality and emotions of Neil Young. If I wanted the stage to be brightly lit, I could use the Onda power cord; if I wanted a more relaxing presentation, the JPS Labs Digital Power Cord did the trick. Adding the CLPS also shifted the soundstage bringing the central performers closer to the listening chair almost up to the plane of the speakers. The soundstage retained its great depth and width, but that is commonplace with my mid-field listening position and the speakers aligned five feet in front of a very long wall. Dynamics were also improved somewhat but not to an extent that it drew my attention away from the music. More importantly, your power cord of choice will affect the presentation. One thing that still perplexed me with the CLPS was the captive cable from the power supply that plugs into the DAC itself. My audio engineering friend Rich tells me that DACs require very little current, but the 20 awg unshielded miniature zip cord seems like a gross oversight in comparison with the military grade cables with screw-down collars that Israel Blume uses with his massive power supplies. Perhaps I should try wrapping it in strips of ERS paper. But their website mentions that the DAC has a "clean power regenerator inside" so maybe that takes care of any noise picked up along this thin captive power cable. With only my vintage Muse model two on hand, I had nothing to realistically compare the Calyx with in my system. But I get around a bit and I've heard some pretty good rigs. The Blue Circle 501ob with LOC upgrade that I mentioned above was in a better sounding system, but that DAC was more than five times the price of the Calyx. One of my very favorite rigs is Israel Blume's Coincident reference rig which features a very high end Esoteric digital front end. I've also listened to familiar material on Wilson Audio Sasha speakers with a Berkley Audio Design Alpha DAC and of course I've heard many rigs with various dCS front ends, particularly the very high end systems with Verity Audio loudspeakers every year at the Salon Son Image at Montreal. I've also had brief exposure to the Weiss 202 DAC. All of these are very highly regarded DACs and range in price from roughly $5000 to $30,000, perhaps more — a very ethereal league, for sure. And I'm also quite certain it will irritate many people if I suggest the Calyx can play in that league. It can, most certainly if you have an excellent listening room and are adept at tweaking your system. On the other side of the coin are a several noteworthy components, namely the OPPO 95 universal player (about $1000) which also features the ES9018 Sabre Reference 32-bit DAC chip for stereo reproduction. Additionally, the OPPO features a lot of video and surround sound technology using a second Sabre chip and includes a transport as well, all of which has received rave reviews. 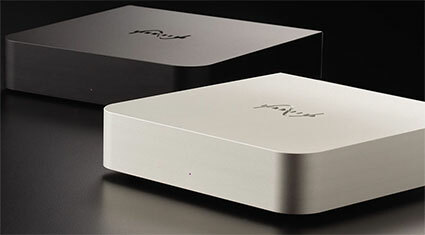 At $1500 there is the Wyred4Sound DAC-2 which also uses the Sabre chip and has received very good press. At a much lower price, the Musical Fidelity M1DAC A ($749), a recently introduced updated model, is said to be an exceptional value and may deserve to be used in much more expensive rigs than it will likely call home. Sorry to say, I have not had an opportunity to hear any of these to the best of my recollection. As I said earlier, a lot will depend upon how a given piece may or may not fit in with what you already own or need. Price-wise, the Calyx DAC with its large power supply will cost $1950 or $2149, depending on which side of the Canadian border you buy it. These prices fall between the two groups above in a middle ground that is home to the reasonable adventurer — someone who is willing to spend a little more on a new brand that will likely prove much more than adequate for their needs, but who is unwilling to spend large on known entities whose potential may never be realized due to shortcomings in the room or other parts of the rig. For many, in these times of economic uncertainty, being reasonable and living within your means, is the way to go. One Ground Round ‘n A Side Of Fries, To Go. The Calyx DAC 24/192 feeds the rest of your rig an accurate, highly focused image of what is on the disc or computer file. It takes you right back into the recording studio or the venue of live recordings if that may be the case. With older recordings it takes you back in time right along with the technologies used to make them. There is not much room for music to hide in the Calyx, yet it responds to various footers and cables to different degrees so it is tunable. It sets a very high standard near the front end of your system, which puts a burden upon what comes further downstream. In my case, the Calyx provided revelation and joy from both CD and computer sourced music. It is a brick that will rock with the best of them…or waltz, if you prefer.